Eastern Nigeria's King of AfroPop, EBlack gives us this masterpiece after taking time to see what he really has for his fans. 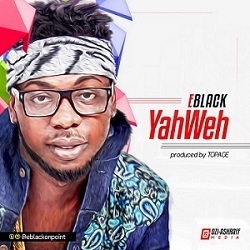 The song "YahWeh" is the latest from the library after ack to back hits like Point & Kill, Touchi Touchi, Mamiyo and ​​Mu​midele. This new joint concentrates on the blessings of God and how its really necessary to appreciate and Motivate others. Kindly listen to this song and drop your comments.